Yesterday we motored out of the Yacht Harbor and down the Sir Francis Drake Channel to Peter Island. We didn't sail because the lines to the mainsail were sticking, and we had not yet put the jib on the forestay because there was too much wind at the harbor. So motor it was. We have decided to take baby steps in everything we do with the boat. Because of this we chose to take a mooring ball the first night as opposed to attempting anchoring. 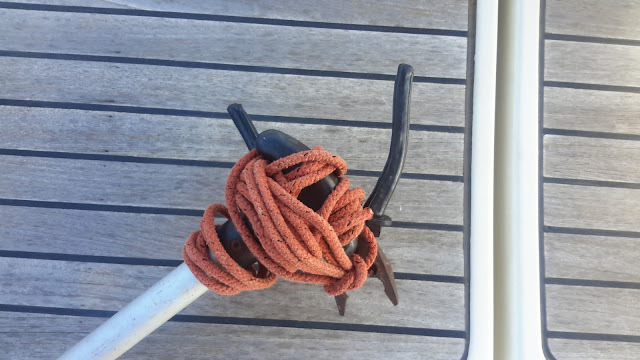 We are confident in our ability to pick up a mooring ball and be safely secured for the night, less so with anchoring. We have anchored fewer nights than we have picked up mooring balls, so sticking with the baby steps theme, we opted for the easier way for us. The way you pick up a mooring ball is to motor the boat very close to the ball, grab the line extending from the ball and loop a line from the boat through the loop on the ball. The problem we had... About 1/2 way to Peter Island we realized that we had not seen our boat hook, essential to picking up the mooring ball. We searched in all the nooks and crannies to no avail. Wracking our brains we tried to think of alternatives. We finally came up with a solution. 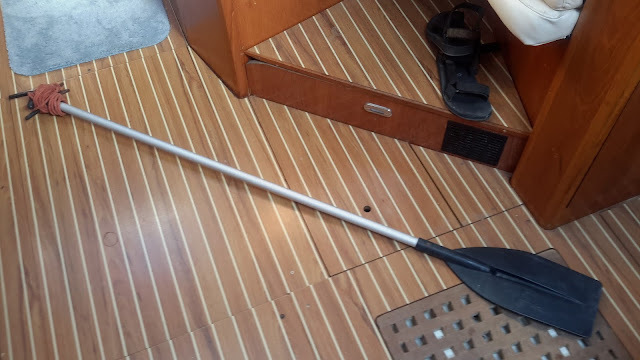 We have a paddle for the dinghy and we wrapped a pair of pliers, in the open position to fashion a crude boat hook. It looked funny, but it worked. Safely moored in Great Harbor, Peter Island, British Virgin Islands. Ready for the next baby steps. Thought you would appreciate the caution! Excellent boathook. MacGyver would be proud. MacGyver has nothing on Bob. He enjoys applied design.